I like when people post crystals on Instagram—they’re pretty; they remind me of musky-smelling science stores; they make me feel important because I have the word “geode” in my vocabulary; and, least of all, they feel vaguely spiritually enlightening. I’ve never touched a crystal with my energy in mind and frankly, the concept of crystals healing anything other than my Instagram aesthetic has always seemed too far out for me. But, I’m a curious creature and the crystal phenomenon is picking up major steam (especially here in LA), so I decided to chat with an expert and entertain the concept. Enter Azalea Lee, crystal healer, jewelry designer, and all around chicer-than-you’ll-ever-be woman. When asked how she transitioned from professional stylist to professional healer, Lee says “I just kept on getting signs from the universe. I’ve always been a spiritual seeker, so I knew I was getting intuitive nudges.” My intuitive nudges usually lead me to the pantry—but with the spirit of “spiritual seeking” in mind, we kicked off one of the most interesting conversations I’ve had. Read on for highlights from our conversation about crystal healing—including how you might meet your spirit animal—plus tips on how to work with crystals on your own. Before we dove too deep, I needed to know the basics about how crystal healing works. “We know that everything in this world, scientifically, is a vibration. So your heart is vibrating, your mind is vibrating, your organs are vibrating. It’s a symphony of vibration. And you might have some thoughts that are out of whack, that are not completely aligned. It’s almost like you’ve been playing a song with a couple of notes out of tune but it seems normal to you because that’s the way you’ve been playing the song, over and over again. So when I bring a crystal in, a crystal has a very consistent vibration,” Lee explained. The consistent vibrations are able to tweak your own vibrations that might be out of sync. 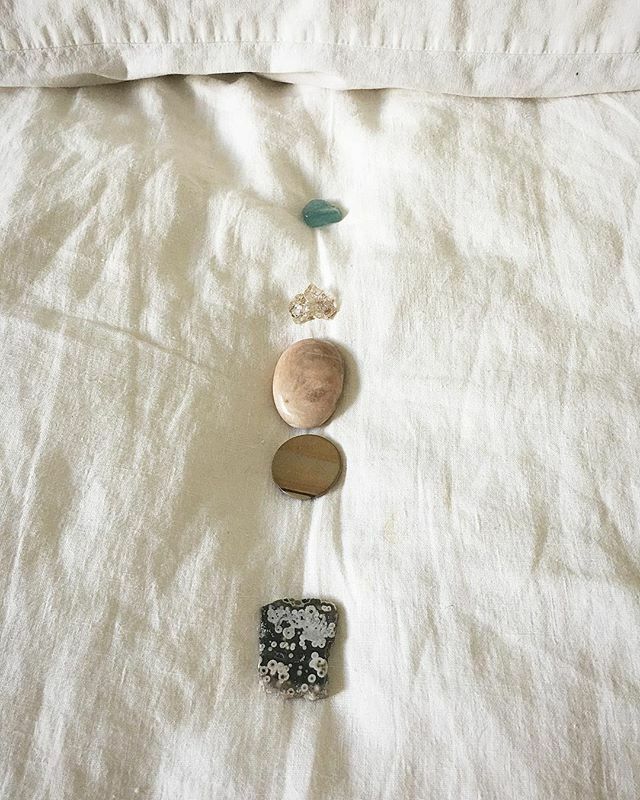 “It feels like being a chiropractor, like ‘oh this energetic thing is a little tight, let me find the crystal to help loosen that.’ Or ‘this one’s a little gnarled, let’s try to make that softer,’ I’m doing all these adjustments with the crystals,” she says. “As long as you’re willing to accept the energy of those crystals, then your soul self aligns with it really quickly because you’re just like ‘oh this feels so much better. Those shoes have been way too tight and this feels so much better. This is a better fitting shoe, I like this space a lot better.’” I can’t help but wonder if the results might be placebo effects, but I’m intrigued. We press on. It’s important to know that there are several different types of crystal healing, and Lee’s process is “very interactive.” To explain, she detailed a standard healing session for me. “When they get the crystals, they start seeing visions, and then we begin talking. People often describe it like lucid dreaming. You’re completely coherent, but you might in outer space, or you might be in your childhood. It’s not hypnosis cause you’re completely in control of any decisions that you want to make,” Lee says. I wonder if she’s there in the visions with her clients. “My job is a little bit like a tour guide. I’m intuitively picking up information as I go along, I can feel something’s in the forest with that person, but I’m not going to tell the person what I’m getting. They’re the ones looking for it. I’m sort of seeing the big picture, like, oh I see why this person is here, I see the thing that we’re going to, and I’m going to help them get to that point,” she says. Lee elaborated with a story about one of her friends whose spirit animal was a unicorn named Harold. As far as spirit animals go, I don’t think that can really be topped, but I can’t help but wonder what might pop up in my own subconscious. She explained that sometimes people are placed in a situation to receive a message—like one client who found herself in a dive bar ordering ice cream, only to receive a message that she needs to trust herself more. Fairly generic message to receive—if you ask me—but Lee’s delivery and passion are so compelling that I fully believe her when she says that was a transformative message for this woman to receive. As we wrap up our nearly two-hour conversation, I feel entranced by Lee’s stories, and relaxed by energy. While I’m not one hundred percent sold that a crystal can really shift my energy, I ask Lee to put me on the short list for a healing session with her. Here’s hoping my spirit animal is half as exciting as Harold the unicorn. Are you into crystal healing? We’d love to hear about your experience—join our conversation on Facebook!